Sleepy Hollow is a Michigan state park located near Laingsburg, Just north of Lansing. The heart of the park is a reservoir known as Lake Ovid. At the lower end of the lake, cut off from the main body of the lake, is a relatively small and flooded area of forest. I liked the look of trees standing in the water. I waited for winter, hoping that ice would form thickly enough out there for me to safely walk over the water and enjoy some nature photography. My patience was rewarded many months after first spotting the trees. Temperatures had been extremely frigid for days. Before dawn, I drove out to the Sleepy Hollow and parked my car nearby. There was no room for parking at the site. Loading my gear on my back, I walked into the park. Just before the lake, I found a path leading down into the forest. Before long I arrived at the frozen water’s edge. The ice looked thick enough to support me. I tested the ice by placing one foot on it and bringing some weight to bear. Ice along the shore is almost always thinner than it is farther out. This is because land is generally warmer than the water, so ice has more difficulty forming along the shore. Also, shoreline plants like cattails emanate a certain amount of heat because they are living organisms. This heat is enough to potentially keep the ice around them relatively thin. Knowing this, I was careful in proceeding. But I was willing to take the risk. I moved quickly out from shore and over increasingly deeper water. I could see from stress cracks in the ice that the ice was at least 8 inches thick. That was plenty for me to feel safe. While a skiff of snow covered some of the ice, it was completely clear and slick. I kept my balance by sliding my boots across the surface, keeping close contact with the ice. 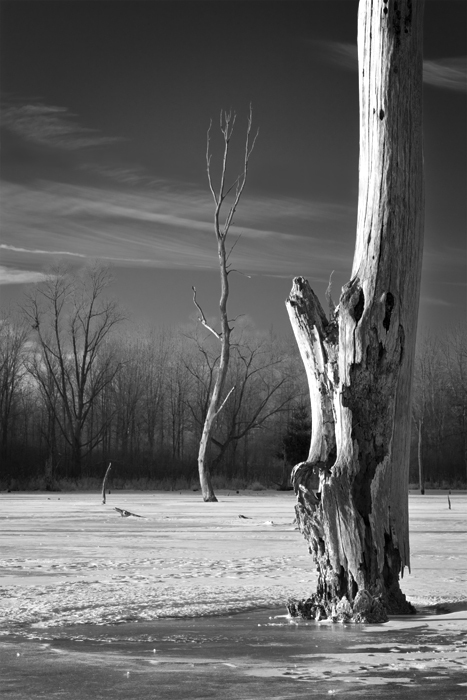 Once I found my shot and set up my tripod and camera, I played. I treated my shoes like skis, sliding for ten or twenty or more feet on the ice. But I could not do that for long. The sun was coming up. “Sweet light” comes and goes quickly. It was time for photography. 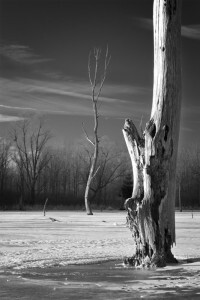 My subject was a large and deeply textured tree in the foreground, with a much more slender tree in the background. The form of the second in some ways mirrored that of the first. In terms of my development as an artist, this is a transitional piece. At the time of this photograph, I was a landscape photographer. I was a nature photographer. Yet, looking back at this period, I can see the beginnings of my fascination with line, pattern, texture, and light. I can see attention to form and visual weight—aspects of art that today resonate throughout my abstract photography.